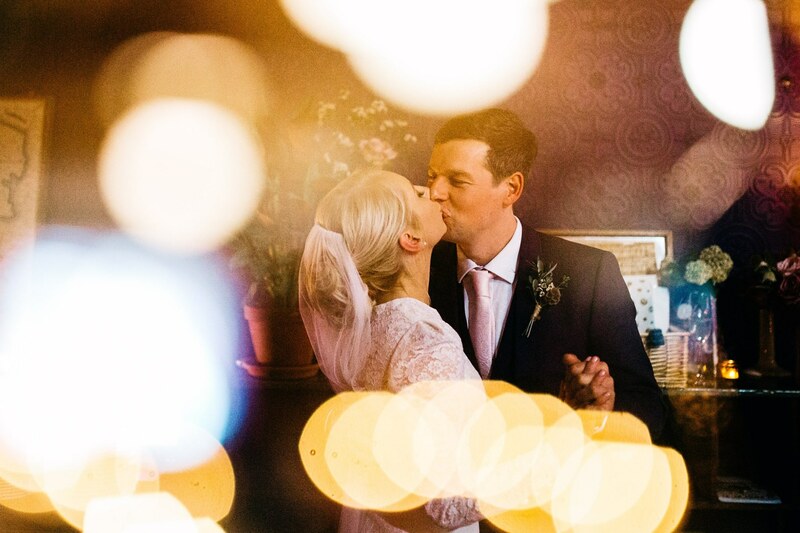 Organising a wedding at short notice could be a little stressful - but not for this super cool, ultra gorgeous Yorkshire couple. Beth and Gez totally nailed it. Beth first got in touch in December 2016, just over 5 months before the big day, and explained the couple had been together for more than 10 years, and had been engaged for ages, but hadn't found somewhere perfect to tie the knot. They wanted something small and intimate but fun, and were over the moon when they found us! Fulwood Unitarian Chapel hosted the wedding ceremony, the couple, their family and friends then made their way to us in their gorgeous VW camper, and a fabulous big red vintage bus. Arriving in Kelham Island for a glass of fizz, some 'I Love You, Will You Marry Me?' Thornbridge Brewery ale and photos in the sunshine. Just check out that dress! Beth, you absolute stunner! Making their way inside, guests were greeted by a forest of flowers. Ridiculously beautiful blooms by Swallows & Damsons adorned every space of The Chimney House, from the urns flanking our doorways, to the delicate concrete planters on the table, lose stems in our collection of antique vases and the huuuuge 5ft wreath on our vintage coat hooks, we were blooming! Taking their seats at our huge antique tables, admiring their super Sheffield personalised Henderson's Relish favours, they settled in for supper. Our Laden Table menu was the triumph of the day, we had juggled a few dishes with Beth and Gez whilst in the planning stages, to concoct their perfect menu, starting with home hot smoked delicate salmon, beetroot carpaccio with goats cheese & herbs, home-smoked chicken, jars of pickled seasonal roast veggies, homemade hummus and herbed yoghurt dips, all served with fresh locally baked loaves of bread to rip apart and pats of fresh butter, our guests tucked in with zeal. Once the starters were demolished, the Laden Table continued with native breed beef slow roast until it was falling apart, with Kelham Island Ale, shallots and herbs, chicken thighs with a herb and garlic stuffing, in a crisp parmesan crust, whole sides of salmon wrapped in parchment, baked with lemon, garlic and butter, golden goodwill veggie pie - stuffed with sweet potatoes, beets, leeks and winter greens, creamy, cheesy autumn vegetable gratin with parsnip and potato, winter red cabbage spiced to perfection, roast cider-glazed sticky carrots with seasonal herbs and perfectly crispy and fluffy potato wedges. For pudding our guests chose from stickiest sticky toffee pudding with caramel sauce and cream, perfect homemade profiteroles, packed with cream and drizzled with chocolate and Sheffield-foraged blackberry Eton mess with lemon meringue. Deeeelightful! Heartfelt speeches followed, to allow a little breather from the mountain of food, followed by a gorgeous cheese course, with locally selected delicacies ready to be snaffled. The couple had arranged a guitarist to come and get the party started - first dances, and a bit of a sing-a-long followed! Cake cutting, and nibbling followed, with a dollop of cream for good measure (Gez & Beth's incredible naked cake was provided by the very, very talented Rachel Edwards of Oh Sugar! - always a delight)! We had such a gorgeous day with Beth and Gez, and all of their families, we know we say it a lot - but it means SO much to us that we're trusted with your big days, and we have the opportunity to help all of our guests celebrate such a huge milestone. We LOVE love! P.S. Check out these completely gorgeous snaps from Danni at Maytree Photography - we just can't wait to see the rest!